Hello everyone, I'm a newbie drone user and I'm trying to set up autopilot to a fixed wing plane. I have a Pixhawk 4 flight controller that I can't quite get to work. 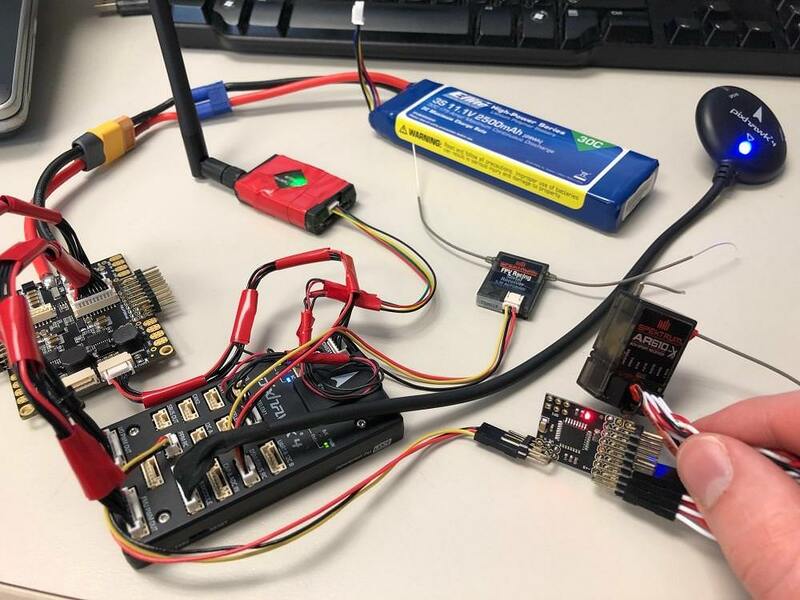 As you can see in the picture below, I have the Pixhawk connected to QGroundControl through a telemetry module, but I can't connect anything in the "Radio" tab of QGroundControl. 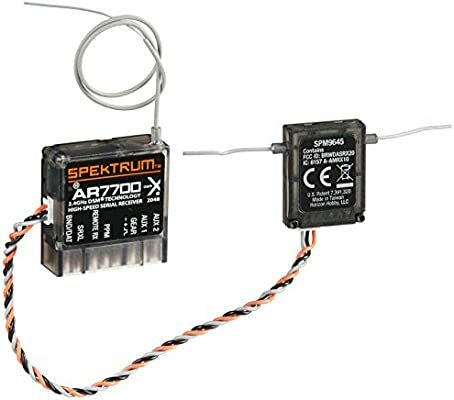 I have a Spektrum receiver and transmitter (receiver is pictured in the bottom left), but putting it into bind mode like the prompt says (after clicking 'Spektrum Bind' then 'DSMX 7 channels or less'), the receiver does not bind. Does anyone have any ideas to what I might be doing wrong here? Are my cables connected incorrectly is the the AR610 receiver not compatible with QGroundControl? Any help is appreciated. Instead of fighting with it just bind it normally with a bind plug. You need to bind it first with your Tx then you'll need a PPM Encoder to use that receiver or just use a Satellite Rx by itself. You mean use the bind plug on the receiver to connect to the transmitter? How exactly does the Spektrum Bind work, then? How exactly does the Spektrum Bind work, then? The Spektrum bind only works if you're only using a satellite receiver from Spektrum or Lemon RX. If that's a PPM encoder, then it should work. - So I would bind the Rx with Tx according to Spektrum process. - Connect the Rx to the PPM Encoder according to the appropriate pins. - Calibrate the Radio per QGC procedure. Alright, I'll take a look at buying one of the satellite receivers, then. Just to make sure, the satellite receiver seems to have a 3-pin connection, so would that work when plugged into the "SBUS out" receptacle? And when you mentioned "RCIN of Pixhawk", I assume that's the same as "PPM RC"... or is that where the satellite receiver should be plugged in? Just to make sure, the satellite receiver seems to have a 3-pin connection, so would that work when plugged into the "SBUS out" receptacle? I don't have a Pixhawk 4 but according to what I've seen, it should plug in to the DSM/SBUS RC port. 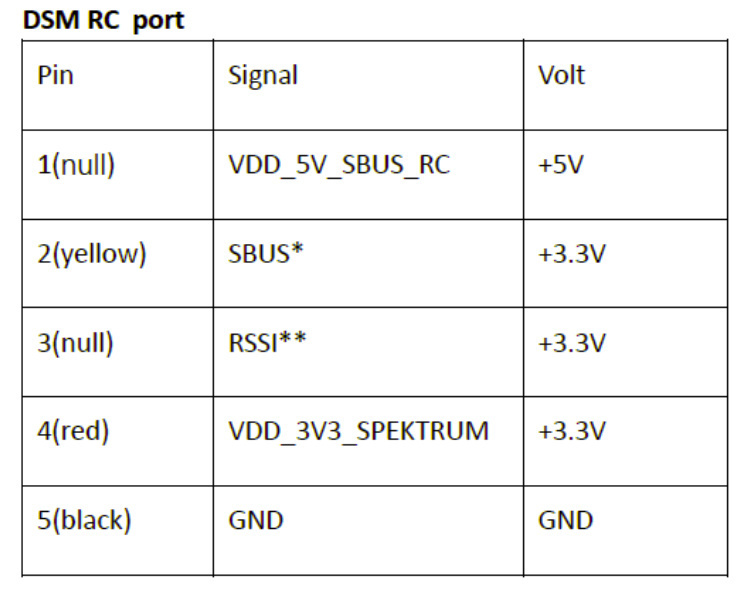 I see, even though the DSM/SBUS RC port is a 5 pin, a 5 to 3 pin connector was included, so the satellite receiver should be able to work. I'll update this topic when I get the receiver and try it out. Thanks for the help thus far! 0) Plug in all of the DSMX satellite receivers (x2 usually) into your radio receiver (e.g. AR9030), they all need to be connected to the radio receiver you are going to bind to. 1) Plug the bind plug into your radio receiver (e.g. an AR9030), power up your RX and your RC Transceiver and hold the bind plug down on the RC Remote Transceiver (I use Spektrum Black). You will hear the usual binding message. 1.1) Remove bind plugs and reboot RC Transceiver and Remote, confirm Red led on and bound. 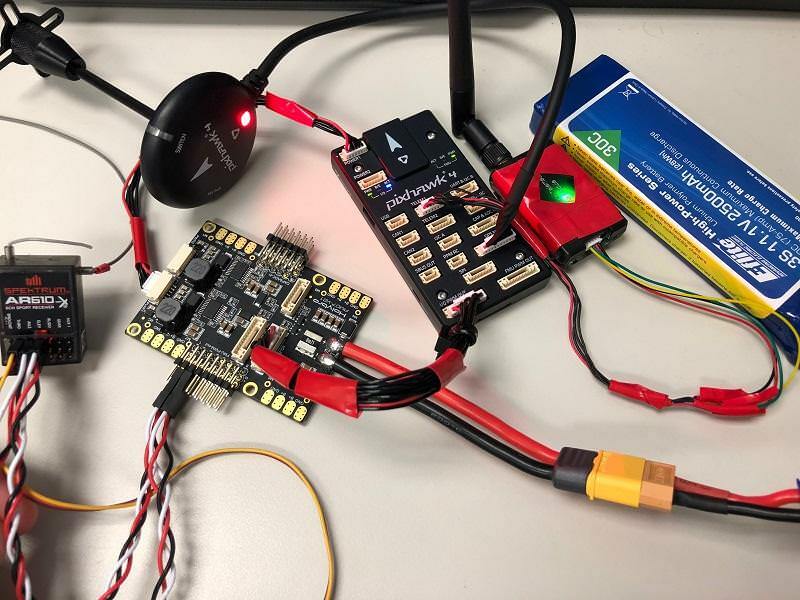 2) Pixhawk v2 - disconnect one of the DSMX satellite receivers from the Radio RX and connect directly to the DSMX port. Use QGroundcontrol and it will find the radio, configure RC and flight mode as documented online in PX4 Wiring guide. Enjoy and let me know how it goes, I've done at least a 1/2 dozen of these already and can help you if you get stuck. I was planning on trying rollys's solution, so perhaps I'll buy the satellite receiver, try that solution out, and if it doesn't work, I'll try what you said and I'll only need to buy the AR770 because I will already own the satellite receiver. AR7700 does native PPM out, yes. PPM encoder comes with Pixhawk, so yes, you could use that as well. Or, you can wire the 3 pins on your Pixhawk 4 and make an adapter. I've got the satellite receiver hooked up to the DSM/SBUS RC port like you said, but the receiver does not turn on like the instructions say it should. How is the receiver supposed to be powered in this situation? How is the receiver supposed to be powered in this situation? All the wires seem to be going to the correct pins. Does that mean I need to find some sort of voltage regulator to make sure it's getting 3.3V? Did you bind it with your Tx first with it connected to the RX (AR610)? Once it's bound, then connect it directly on your Pixhawk then do Radio calibration from within QGC. But how does the satellite receiver connect to the AR610? 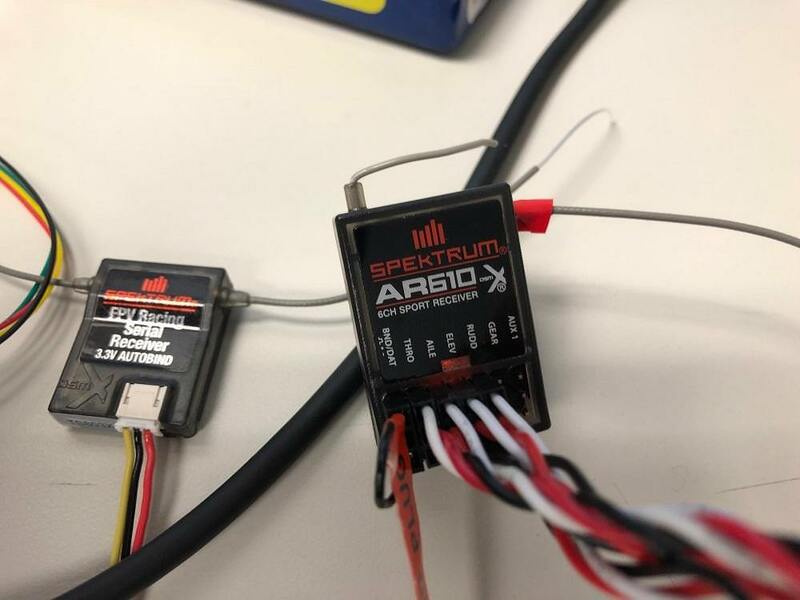 I've seen some of the spektrum receivers have a slot in the side for a connection to a satellite receiver, but the AR610 doesn't have one. But how does the satellite receiver connect to the AR610? I'm sorry, my bad. I thought that had a satellite port. 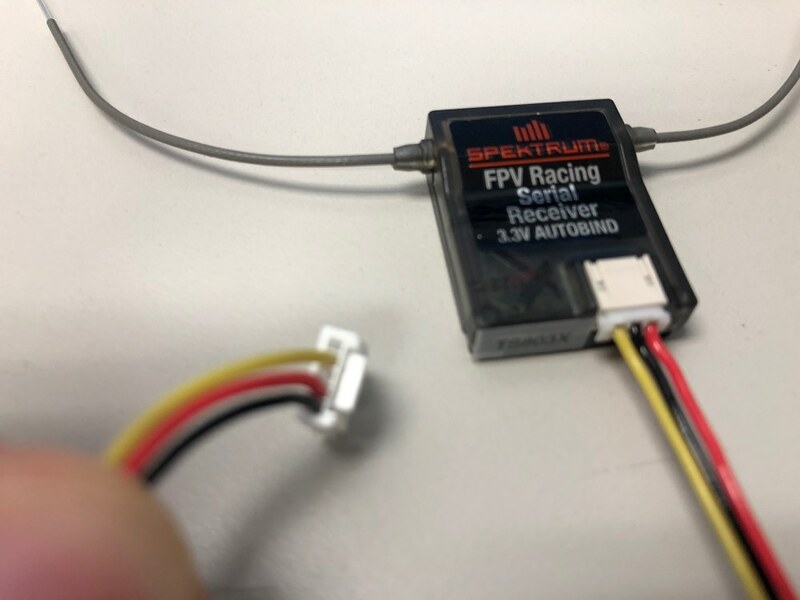 Do you have any Spektrum Rx with satellite port or can borrow one just to bind your TX to it? Unfortunately, I don't, so it seems I'll need to purchase a AR7700 receiver like jfd said. So when you connect the satellite Rx and power the Pixhawk, the satellite doesn't power up? No LED comes on? Do you have a voltmeter to check which pin is ground and which is 3.3v? Also, I just found this so I think it's definitely a good idea to trace out the wiring from the Pixhawk to the satellite Rx. 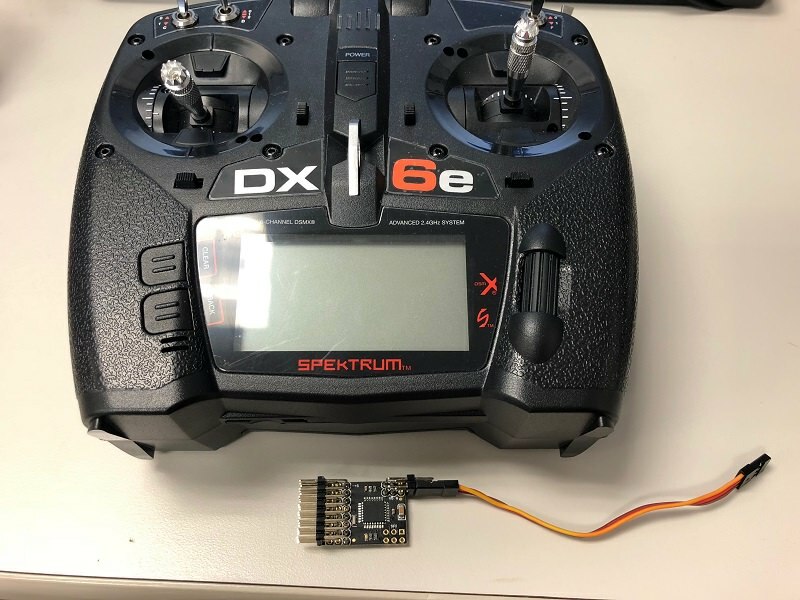 Issue: Can't bind a Specktrum receiver to Pixhawk 4 board. Yup, the LED isn't coming on, and unless the wiring is backwards on the connector in the picture from earlier today, the connector seems to be a perfect fit with the chart you posted. It's a bit hard to tell, but the AR610's LED is lighted up and the SPM4648's LED is not turning on.